With fewer than nine months to go before Election Day, The Signal predicts that Barack Obama will win the presidential contest with 303 electoral votes to the Republican nominee's 235. How do we know? We don't, of course. Campaigns and candidates evolve, and elections are dynamic events with more variables than can reasonably be distilled in an equation. But the data--based on a prediction engine created by Yahoo! scientists--suggest a second term is likely for the current president. This model does not use polls or prediction markets to directly gauge what voters are thinking. Instead, it forecasts the results of the Electoral College based on past elections, economic indicators, measures of state ideology, presidential approval ratings, incumbency, and a few other politically agnostic factors. We'll dip into what the model says in a moment, but first a note about models in general: there are a lot of them, from complex equations generated by nerdy academics (like the team at The Signal) to funny coincidences like the Redskins Rule, which holds that the incumbent party keeps the White House if Washington's football team wins its last home game. (This is true in 17 of the last 18 elections!) Every year, some of these models are right and some are wrong, and the difference is often just luck. As a result, models get a bad rap as being very good at predicting the past and lousy at predicting the future. But every election gives researchers more data to work with and a better idea of what works and what doesn't. Not all models are bogus just because many of them are. Our model combines powerful scientific algorithms with both real-time and historical data sources. We have examined the last 10 presidential elections and found that the Yahoo! model, which is the work of Yahoo Labs economists Patrick Hummel and David Rothschild, would have correctly predicted the winner in 88 percent of the 500 individual state elections. 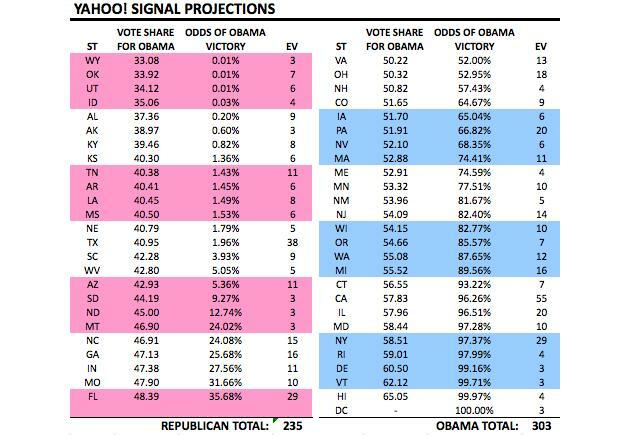 The following chart shows our predictions for each state in the general election, based on this model. The Yahoo! model assumes that the president's approval rating will stay the same between now and mid-June, that each of the 50 states will report personal income growth that is average for an election year, and that certain key indicators of state ideology will remain unchanged this year. Although the model currently predicts that Obama will win 303 electoral votes in November, please note that it predicts only probabilities of victory, and that many states are nearly toss-ups. Because Mitt Romney has the lead in the delegate race for the Republican presidential nomination, for this table we assume that the Republican candidate's home state is Massachusetts and that the Republican candidate's home region is the East. This may be a conservative estimate for Obama, because January's economic indicators suggest that the states are likely to experience greater-than-average income growth in the first quarter. We will update our predictions accordingly when the actual data from the current year is available. A key finding of the model is that economic trends—whether things are getting better or worse than they were a month ago—are more meaningful than the level state of the economy. In other words, whether the unemployment rate is increasing or decreasing is more important than what the unemployment rate actually is. Another lesson of this model is that, while campaigns and candidates matter, they don't matter all that much. Despite the varying quality and positions of the campaigns and candidates over the last 10 presidential elections, variables beyond their immediate control describe the outcome very well. A brilliant or lucky campaigner is at an advantage, but the net effect of politics and strategy, averaged over the past 40 years, is just the small variation that the Yahoo! model cannot predict. In the following weeks, The Signal will have more posts that describe how the model was built and what its implications are. Rothschild is scheduled to give a talk on an academic paper that he and Hummel are writing on the Yahoo! model in May at the American Association for Public Opinion Research national convention. David Rothschild is an economist at Yahoo Labs. He has a Ph.D. in applied economics from the Wharton School of Business at the University of Pennsylvania. His dissertation is in creating aggregated forecasts from individual-level information. Follow him on Twitter @DavMicRot and email him at thesignal@yahoo-inc.com. Chris Wilson is editor of The Signal. Follow him at @chriswilsondc.